Hello crafters! A while back I posted a project titled, Repurposed Jars for the Holidays. 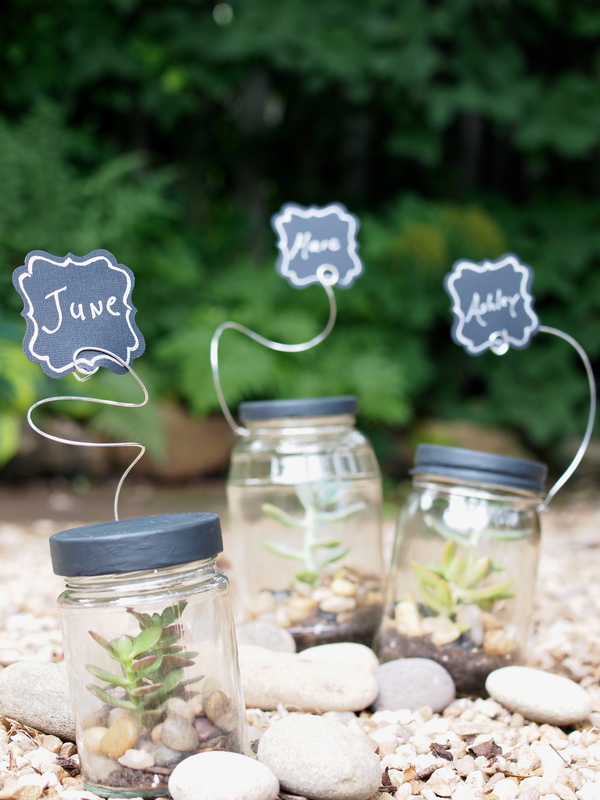 It was a big hit on my blog so I decided to repurpose MORE jars but this time as tiny terrariums. I think they’d be awesome as wedding favors! With the exception of the jars, succulents and potting soil, you can pick up all project ingredients from your craft store. The succulents and potting soil can be purchased at your local plant nursery. Empty, clean and remove label from the jar. Paint jar lid your favorite color. Add about 1/2 inch of soil to the bottom of the jar. Remove the succulent from the store container and remove any excess soil that is around the root system. Don’t worry about hurting these little guys, they’re super resilient. 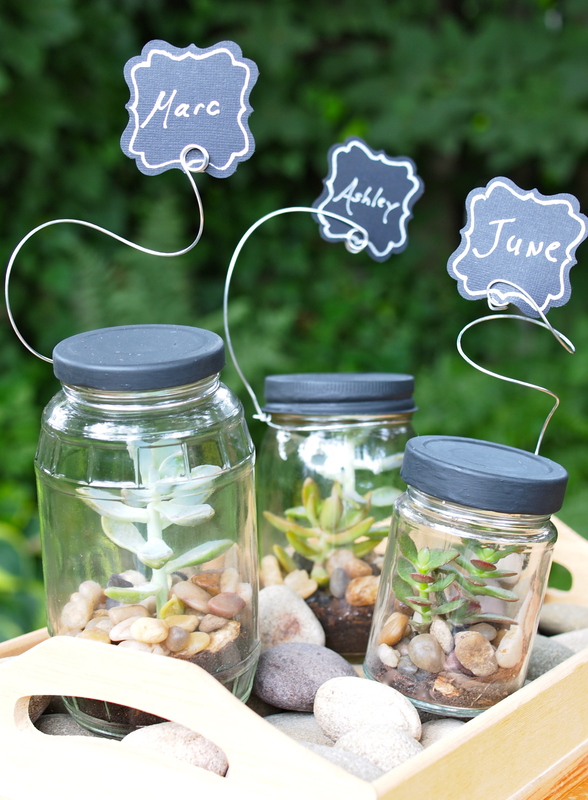 Insert the succulent into jar and secure the roots of the succulent in the soil using a small spoon or twig. Add a layer of pebbles. Cut a section of wire to wrap and twist around the neck of the jar. Using a pencil, curl the other end of the wire around the pencil to create a coil – this will hold the name tag. Create a name tag with card stock paper, slip it in the coiled end of the wire and your done! Check every couple of days to see if your terrarium needs water. If it is dry add a tiny bit of water. If your terrarium is closed, take off the top every couple of days to air it out. If you see lots of condensation or have added too much water, leave the top off until it has had a chance to dry out. Pull off any leaves that show signs of yellowing or damage and prune plants if they grow too large. Don’t fertilize your terrarium because you don’t want to encourage growth. Last week I had the privilege to do some floral styling for a video shoot. The photographer we worked with was photo journalist and Pulitzer Prize recipient, Matt Rainey. The images he captured are exquisite and Matt was kind enough to share these photos with me so I could share them with you. 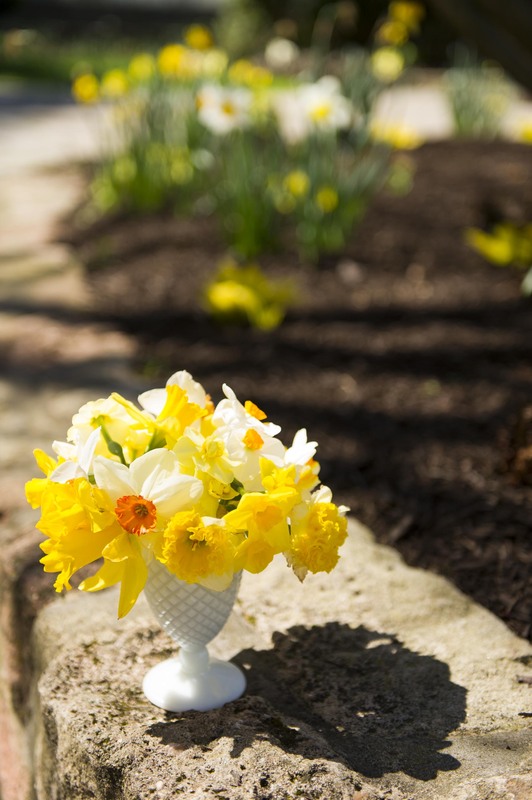 For this assignment, I used simple and elegant thrift store vessels to compliment the freshly cut spring flowers. There’s really no need to spend big buck on vases … let the flowers express themselves. Spring is here and what better way to celebrate than to make this unique and elegant garden wreath. Simply gather nature’s gifts and start creating! 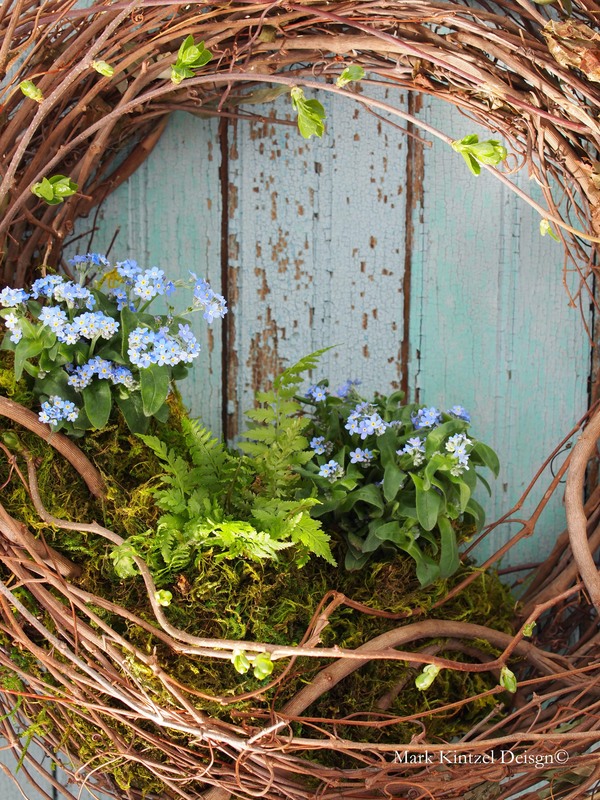 Expand the wreath by pulling apart the vines to create a nest for the plants. Remove the plants from their pots and gently remove most of the soil from the root ball. Not to worry, these little guys will survive just fine. With your hands, create a small ball at the base of the plant by molding the roots and the remaining soil. 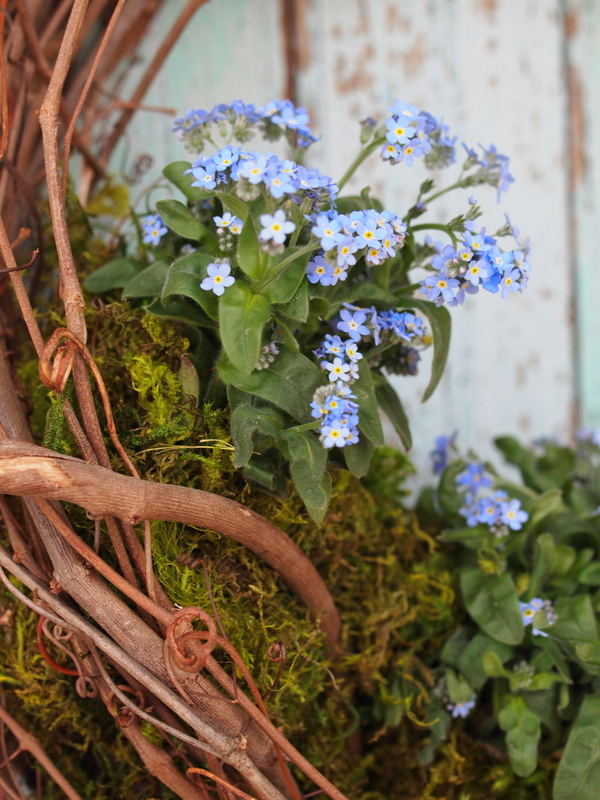 Cover the root ball with sheet moss and tie it securely with florist wire and insert into your wreath. It’s so simple and to keep your creation fresh, simply water when the moss surrounding the root base is dry to the touch. Happy spring and happy crafting! Last August I had the honor and privilege to design and create the bridal party bouquets for the sweetest of brides. For Tina and Miguel’s wedding, Tina requested pink for her bridal party. For me the hardest part of her request was focusing on the perfect combination of flowers and since there are a gazillion to choose from, I needed to create the perfect recipe for a perfect pink bouquet. Anyone who knows me knows well that I’m a gigantic mess before any wedding or event. This wedding was no exception and ultimately, Tina loved the bouquets….phew! Tina and Miguel you are beautiful and thank you Candid Moments Photography for providing these stunning images of their special day.